Quran lectures are hosted by Asarul’Islam Syed, Pakistani-American neurologist and psychiatrist from Bakersfield, California. He was a pupil of Pakistan’s most renowned Quranic scholar and thinker, Ghulam Ahmed Pervez. 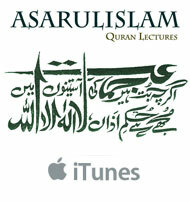 The lectures are archived on QuaideAzam website and are popularly known as Asarulislam Lectures on iTunes. Asarul’Islam delivers the rational message of The Quran from Shalimar Radio in Los Angeles every Saturday at noon. Have you ever thought how terrorism can be effectively eradicated by spreading the True Message of Quran? Asarulislam Syed, M.D, Neurologist and Psychiatrist is a US citizen, from Pakistan, a Quran scholar known as "Cannon of The Quran," who lives in California. "The only anti-dote against poisonous Islam are my Quran lectures, " he proclaims on his blog, www.QuaideAzam.com. A patriotic American, following September 11, 2001, in response to the President’s call, “This is not Islam. They have hijacked Islam,” Asarulislam conscientiously rose as a strong voice against terrorism. He delivered several speeches at various local University forums in Bakersfield, asking millions of suppressed liberal Pakistani Muslims and Christians to rise and support his mission: “Liberating the Hijacked Islam.” Beginning in 2008, Dr. Asarulislam delivered weekly, one hour enlightening sermons through Shalimar Radio, Los Angeles, every Saturday at noon on Channel 900 AM. The station shut down for want of funds in 2010. His sermons, based on reason, attracted a huge audience internationally. “The founding fathers of the United States imbibed The Message of the Quran in its truest letter and spirit,’ he proclaimed. Committed to his Mission, preaching the liberating Message of The Quran, totally different from criminal Wahhabi beliefs, Dr. Asarulislam’s Radio Broadcasts, inspired thousands of passive, suppressed liberal Pakistanis. JANNAT PAKISTAN EDUCATIONAL MISSION is a religious reformist movement lead by Dr. Asarulislam Syed, CEO. JANNAT PAKISTAN aims at eliminating bigotry, hate and prejudice in the Pakistani youth against the civilized world in general and against the United States of America in particular. JANNAT PAKISTAN’S educational program propagates the promotion and establishment of universal human ideals of equality and equal opportunity, irrespective of religion, caste color or creed. JANNAT PAKISTAN aims to promote modernization, introduce religious reforms, promote emancipation of women and bring enlightenment of the poor and underprivileged masses of Pakistan. JANNAT PAKISTAN aims to liberate Muslims from poisonous beliefs of Taliban by promoting the liberal and progressive ideals of Quran. A commentator on his blog said, "USA should air-drop CDS and DVDS of Asarulislam's Quran lectures instead. They have a far greater potential to bring cognitive change and there might have been no need for dropping bombs." Another commentator calls Asarulislam's Quran rhetoric as, "Drone Attacks that transform minds." JANNAT PAKISTAN has set up a vast network of loyal fiduciaries in Pakistan in every city. These are the weakest minority, The Quranist Muslims. "I need money to spread my educational mission, to distribute CDS, DVDS, hand bills," he says. Please visit www.JannatPakistan.org to read more about my mission.